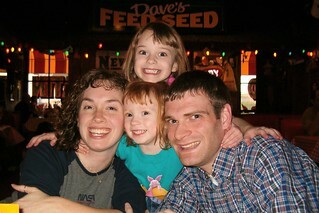 Grandma and Grandpa joined us for dinner at Famous Dave's last night (Kids eat free on Monday and Tuesday nights). We had some good food, as usual and Grandma took this great picture with her new HP digital camera. Afterwards the girls got to go for a ride in Grandpa's new Mazda truck. It's an extended cab with two tiny little jump seats, which are just about big enough for the girls only. When are the rematches ? It was all thoses BBQ Ribs that made my fingers slippery ... Yeah thats the ticket. I just love that picture and those kids and grandkids! Thanks for the fun! No I haven't! Next time I'll try taking you down with me. I'm ready for a rematch as well. P.S. I think you need someone to spell check for you. Rematches are an open invitation, whenever. As for the spelling mistake, I would call that more of a grammatical error on my part. The spelling was correct, I just typed the wrong word. Luckily I can fix that and no one will know the difference. Yeah I already fixed the error. I typed the word and instead of any. Like I said there is an open invitation to come over and play. I've had my rematch and I won!! I didn't fall off the bridge once and Mattey didn't help with distactions either. Sweetie, if you want a rematch I'm ready any time. Yeah I'll admit it. One night after going undefeated, I didn't win a single race. I can hope for the best two out of three.